The world’s first wave energy power station has been switched on after being connected successfully to Western Australia’s electricity grid. The station will provide electricity and desalinated water for Australia’s biggest naval base. An opening ceremony was held on Wednesday in the presence of Minister for Industry and Science Ian Macfarlane and Australian Renewable Energy Agency representatives. 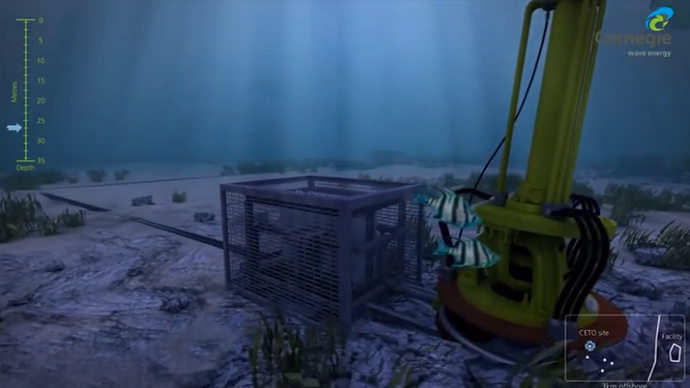 Developed by Carnegie Wave Energy, the project is based in Perth. The station will provide renewable electricity for Stirling, Australia's largest naval base on Garden Island. The station consists of numerous buoys called Buoyant Actuators under the ocean surface, which create hydraulic pressure when they are moved by the waves. The pressure is then converted into electric power and transferred to its destination. The station consists of two units, with one more expected later. The total power capacity of the station will be three megawatts. The units have already provided enough energy to power the equivalent of between 1,500 to 2,000 households. The special technology also provides protection of the whole system from corrosion and damage during storms. In addition to producing energy, the CETO technology also enables getting desalinated water. "We're really excited to be putting power into the grid to supply HMAS Stirling on Garden Island,” Carnegie CEO Michael Ottaviano said. "It's a culmination of about 10 years work, about $100 million in funding, most of it from shareholders, and also with the support of the Federal Government and the State Government of Western Australia, and the Department of Defense." According to the Carnegie specialists, waves are a very reliable source of energy as they are always active. "Our wave resource in Western Australia is the best in the world, and theoretically the resource that hits our coastline every day could power the state 10 times over," Ottaviano said. "Across the country, it's the best in the world as well, and the resource there could power the country twice over, so the opportunity is huge and Australia should be a world leader in this particular technology because we've got the best resource." The Carnegie Company is continuing to work on the technology and it plans to make these kind of renewable power stations popular in Australia and all over the world. "This technology... can operate in a variety of water depths, swell directions and seafloor conditions and can generate power for both onshore and offshore consumption," Western Australia's Energy Minister Mike Nahan said.